Vegetarian and vegan cooking should celebrate vegetables rather than forcing them into a meat-shaped box. I'll take "oh damn, I didn't know I liked eggplant" over "this is surprisingly tasty, but I'd rather eat real bacon" any day of the week. Veganised recipes can feel like a cop-out; this one works because it's anything but. 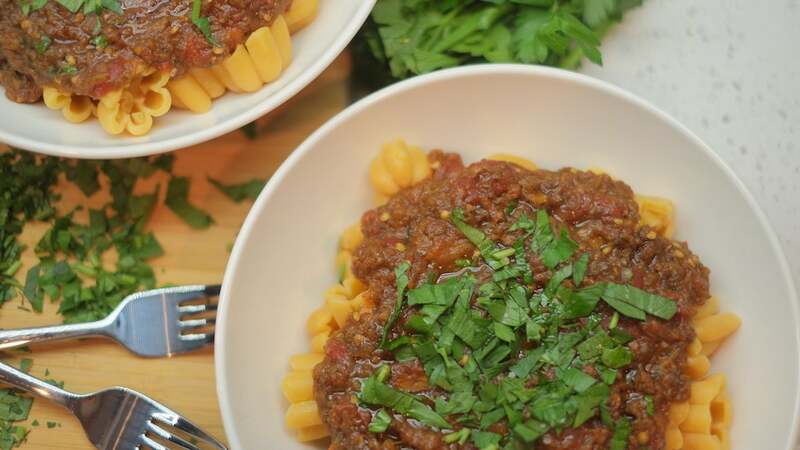 Like traditional ragú, you spend a lot of time sweating vegetables and browning the base to build flavour; unlike traditional ragú, this one gets its body from several kilos of minced mushrooms and roasted eggplant. There's one exception, though: stock. Good stock makes a dish more flavorful, of course, but more importantly, it adds richness and body. 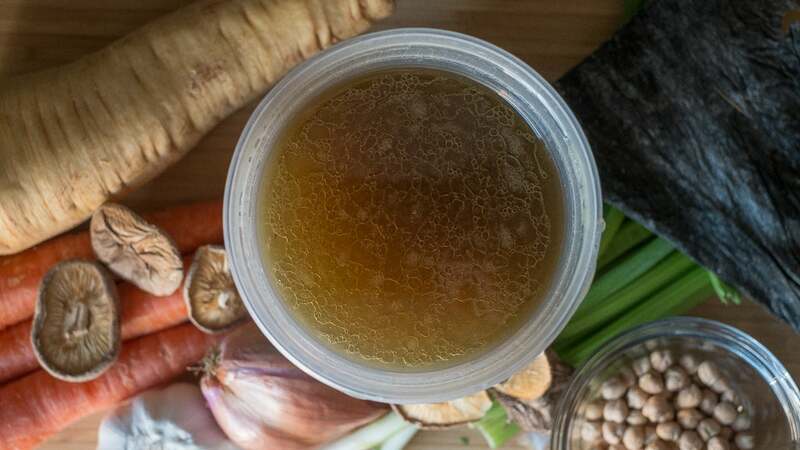 Full-bodied meat stock is easy to make because animal bones and meat scraps boast plenty of fat and all manner of collagen, but since vegan collagen doesn't exist, vegetable stock is often little more than vaguely savoury vegetable tea. Great vegan stock actively tries to replicate the specific properties of animal fat and connective tissue, which is actually easier than it sounds; once you accept what vegetables can't do, any perceived shortcomings become sweet, sweet opportunity. 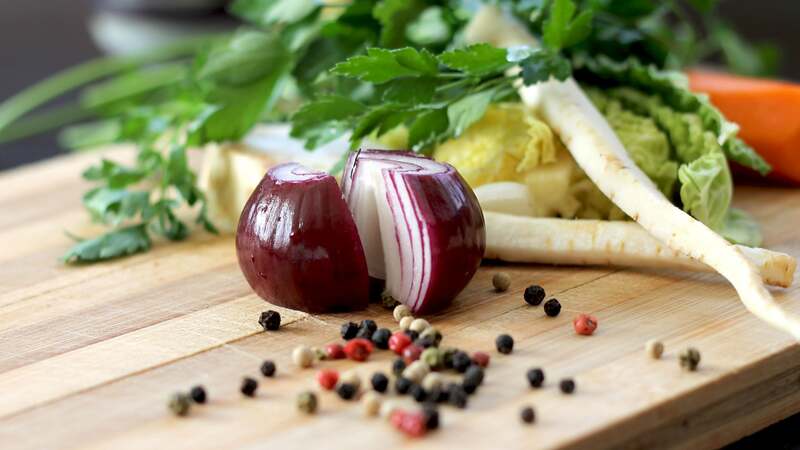 Vegetable stock tends to lack three crucial properties: rich flavour, fat, and collagen. Adding them back is what separates great stock from weak-arse tea. The technique is standard — brown chunks of vegetables and any tasty scraps in a big pot, add seasonings and water, cook under pressure for an hour (or simmer for three) and strain — but truly wonderful vegan stock hinges on deliberate ingredient selection in a way that meaty stock very much does not. Here's what I use to make sure my veggie stock ticks all the boxes. Parsnips: If I had to give one Pro Tip for better stock, these are it. Parsnips lend a sweetness and subtle bite that nothing else can touch, and they're starchy enough to add some body without completely disintegrating. Carrots and my beloved celery root have a similar effect, but parsnips are the holy grail. All the alliums you have: There's no such thing as too many alliums in veggie stock. I use a whole head of halved garlic and a halved onion or two, plus any spring onion and leeks I have. Don't you dare peel them — the skins do great work. Dried mushrooms: Chuck 'em in by the handful, I say. I buy mine at Asian markets, where they're both abundant and very affordable. Chickpea aquafaba: Replace some of the water with aquafaba — canned or homemade — for extra flavour and body. Aquafaba from other light beans works, too, but chickpeas taste the best, and I'd avoid anything darker than pinto beans. Nutritional yeast broth: I learned this trick from noted Pho Genius Andrea Nguyen, who steeps 'nooch in hot water and uses the resulting umami juice to season her vegan "chicken" pho. I don't particularly like 'nooch, but this is utterly brilliant. 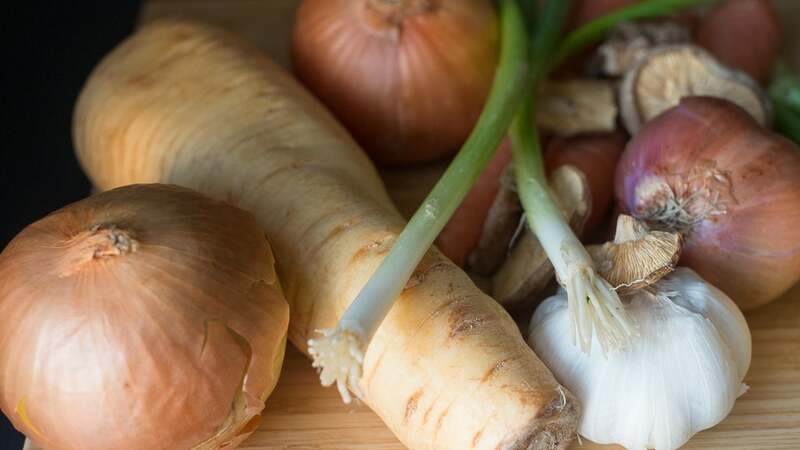 To maximise the flavour of the ingredients you've chosen — which had best not include brassicas unless you're making fart soup — you should deeply brown at least half of them before adding seasonings and water. A mixture of browned and raw vegetables yields the most complex, meat-like flavour profile. Speaking of browning, all stock needs fat — solid fat — to be its best self, and since plants are devoid of subcutaneous fat and bone marrow, you gotta compensate. Always use something that's solid at room temperature to approximate the unctuousness of animal fat. 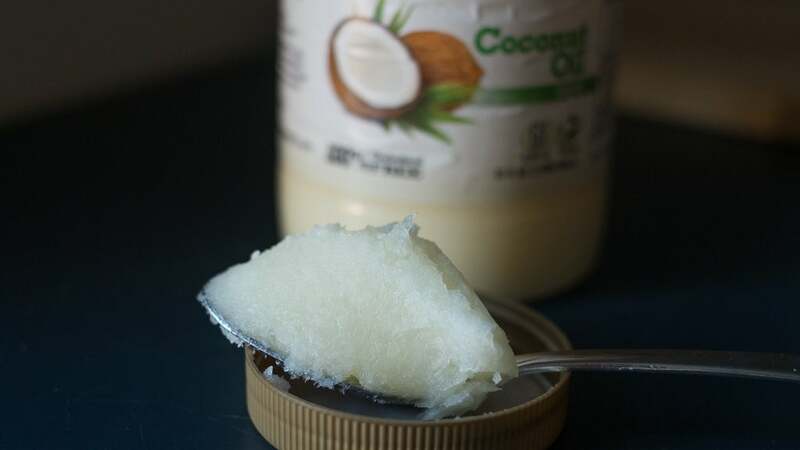 A big chunk of butter works great for vegetarian stock, and vegan stock benefits greatly from the liberal application of refined coconut oil. You can use the virgin stuff if you don't mind subtly coconut-y stock, but refined coconut oil has so many uses — Sugar cookies! Fried-food-aroma-free doughnuts! Stovetop popcorn! — that I think it's worth keeping around. Add some acid (I use a capful of apple vinegar) to help incorporate the fat into the stock as it cooks. Once you've assembled an elite squad of flavorful, fatty ingredients, it's time to tackle the most elusive vegan stock property of all: collagen-like richness. Vegan collagen isn't a real thing, so incorporating this specific and crucially important texture comes down, once again, to careful ingredient selection. Whether you prefer base ingredients with thickening qualities or powerful thickening additives, you have several options. Personally, I prefer to choose ingredients that thicken stock as they cook. Parsnips and aquafaba are particularly great for this, as are kombu (dried seaweed sheets) and dried white beans (especially chickpeas). 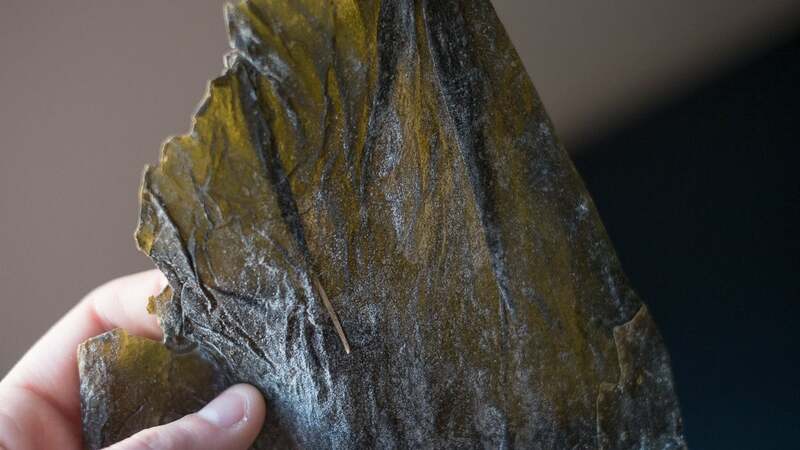 Kombu has that magical seaweed jelly thing going on, but it can make for a strongly ocean-y broth if you use too much; I use about a third of a sheet per gallon of stock. As for dried beans, just a handful will add some body, especially if you use a pressure cooker. If you're after even thicker, more gelatinous stock, a dedicated thickening agent will help — but go easy on them. Only add thickeners to adjust the viscosity of otherwise-finished stock: if it's destined for, say, vegan demi-glace, reduce the stock completely before mucking about with powdered additives. Agar agar, carageenan and pectin are excellent gelling agents that won't cloud up the finished product, so they're ideal for vegan consommé or other clear soups. Arrowroot powder, xanthan gum, and good ol' cornstarch are powerful thickeners too, but will render your stock opaque and a bit sludgy — perfect for gravy or vegan tonkotsu-style noodle broth. Whether you're a lifelong vegetarian wishing for better stock or a curious omnivore, I hope you find something in here that changes the meatless stock game for you. Do you have any secret ingredients I missed, or a favourite way to use veggie stock? 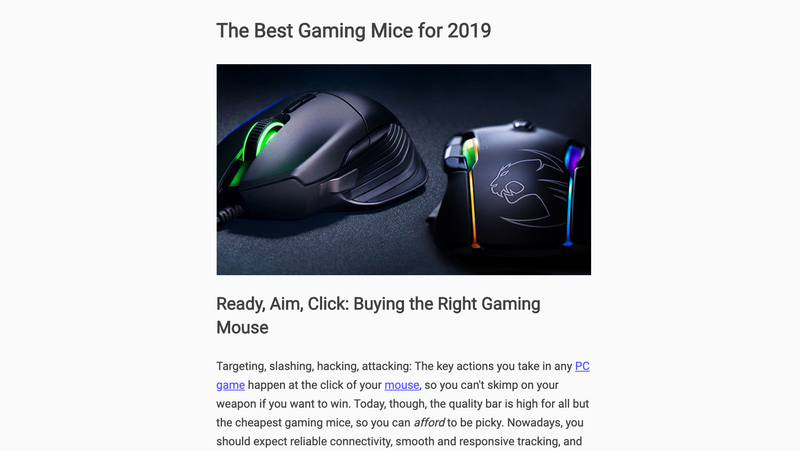 Tell me about it below.